With the European debt crisis still not resolved, you’d think a European company like SAP would be playing it safe. 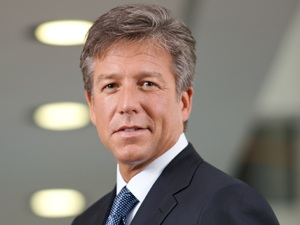 However, there’s not a cautious note in anything Bill McDermott, SAP’s co-CEO, says. Having last week reported that quarterly earnings surged — in part because it’s likely to pay smaller legal damages to Oracle than had been expected following the TomorrowNow lawsuit — SAP showed strength across all its geographic regions as sales of its software licenses increased 28 percent. The next day, McDermott stopped by my office in New York, where we talked about SAP’s plans for the cloud and mobile applications. But first I asked about SAP’s role as one of two targets that cloud application companies like Salesforce.com and Workday are gunning for. AllThingsD: Business at SAP seems pretty good, as your recent quarterly results bear out, but you have all these different companies gunning for you. Whether its Marc Benioff at Salesforce.com or Aneel Bhusri at Workday, and several others, they all say they want customers from Oracle and SAP. You’ve got a lot of these high-protein customers that everyone wants to take away from you. What does that mean for you? McDermott: If you look at the market we serve, we have 176,000 customers, and the best names in the world run SAP. It’s no mystery that a Salesforce or a Workday or any number would want to take some of that away from us. They want a bite at that apple. The difficult thing to replicate is what it took 40 years to build. The big themes we have in our favor is one, we have this consistent core platform. If you think about it, you’re a CEO, you have a company, you build things, you have financials, you have supply chain, you have customers, you have suppliers, and on an end-to-end basis you have to make the business network logistically sound and operationally excellent because there’s a lot of endpoints, and margin points in doing that well. And by the way, if you don’t do it well, odds are your competitor will and you’ll lose the game. This is a foundational layer. That took 40 years to build into a masterpiece. And so what are some of the newer themes? One recent trend that’s important is this idea of the real-time enterprise. Most of these companies are dealing with heterogenous environments for one reason or another. They had legacy systems, they bought other companies, they’ve done things with maverick buyers, so they have a lot of stuff. They’re looking to aggregate all their data into one comprehensive master data strategy. That’s where the magic of the platform happens because if I can get the data aggregated in the right way I can ask the platform any question I want. So we layered on business analytics technology and this thing called HANA, the high performance application appliance, puts all that information in main memory, so you don’t have to go to the disk to get your data. It’s right there in main memory. For example, let’s say I’m an auto manufacturer and oil prices spike. Smaller cars are going to sell better than big ones and so my mix is going to shift accordingly. What’s that mean to my earnings per share? In the old days that would mean lots of analysis and lots of spreadsheets and after three months you get sort of an answer. Now you can just ask the system the question and it will give you the answer based on data. When I think of SAP I think of an older-world type of software that has to run on-premise, and as we both know that’s a model that’s constantly under attack from people who say the cloud is where it’s at. But SAP has its own cloud strategy and product, doesn’t it? We also have our own cloud strategy. And we have a serious plan to promote SAP Cloud. And in that cloud we’re going to unleash Business ByDesign. We’ve been on a slow roll to 1,000 installs this year. That is the commitment we’ve made. The beauty of Business ByDesign for small- and mid-sized companies is that it does all the things an on-premise suite can do except it does them in the cloud. So we’re going to let the tiger out of the cage. The second thing we have is Sales OnDemand. It’s very like Facebook in its orientation. It’s a people-friendly app. The sales professionals love it. It doesn’t take a management hierarchical point of view. This is taking a more people-to-people, community-to-community approach, where you’re in pursuit of a sales opportunity and everyone in the flow who needs to participate. We think that is going to make a big difference. So far the feedback is that the customers love it. Is this essentially a case where you have a cloud offering and it’s really just not promoted all that well? Yes. I think there’s a lot of it that we don’t market and there’s a lot that we’re assembling for scale right now. And that’s because we see a market opportunity. When we look at the participants in the market, we’re not overwhelmed, and let’s leave it at that. We want to turn on our best SAP playbook and get busy being the standard in the cloud. We think we can do it in business applications. Then lets talk about applications. Where do you see your strengths and weaknesses relative to the competition? That’s an important part of this quarter. We chose an innovate-the-future versus a consolidate-the-past strategy. Others chose to buy companies, consolidate them, rationalize the headcount, leverage the margin and improve shareholder value. It’s a viable strategy. But what we chose to do was to innovate and let that be our guidepost. And we think if we can innovate and make the customer the first, middle and last part of our story and encourage a large part of our ecosystem to do the same, the customer can see the difference between consolidation and innovation. I think customers are seeing a new SAP in terms of attitude and speed of execution. SAP is also widely exposed to Europe and yet you seem to be hanging in there nicely. The conventional wisdom says you’d be worried sick about the economic troubles on the continent. What are you seeing in Europe, good and bad? I’m hanging in there because — take a company like Carlsberg, the beer company. And they have an interest in point of sale right now. So they’re using SAP to connect on their mobile device at the point of sale to their supply chain so that the shelves are always filled with Carlsberg beer wherever it’s selling so that the customer always has that choice. These companies are living in uncertain times but they’re investing because they know that if they do and others don’t they get a leapfrog advantage. If they don’t do it now, and others do, they lose the game. The companies that invest in downturns and uncertain times always come out the leaders in their industry when things improve. CEOs know this is not a choice anymore. Technology is not just an enabler of business anymore. It often is the business. So what are your big bets for the time we’re in? Bet number one, we’re going to remain the world’s leading business software company. We have a 2.5x lead on the number two and we intend to extend that. We are absolutely going to a be cloud player. The SAP Cloud is a real strategy and we’re going to turn the corner on that by letting the world know that we’re here and we’re here to win. We have a very interesting company in terms of database technologies. HANA is part of that, but we also have SyBase. We think we can be a strong player not only on the database side, but also on the main memory side with HANA as the flagship. We believe we’re the mobile business software standard and we’re now the number one and industry standard and we’re committed to remaining the business analytics leader. We have a 1.5 to 2x lead. Those are the five things we’re going to do to absolutely change the world. Whether the European debt crisis is serious or not, we’re not backing down on the strategy. Like I say to all the CEOs who care to listen, don’t let all this make you back off your strategy because if you decide to slow down or sit on your hands and wait for things to improve, you might just get wiped out by your competitors.